Dec. 10, 2014 1:00 a.m.
Cliff Ronning, Kirk McLean, Dave Babych, Jyrki Lumme and their teammates are in for a stern test on Sunday, Jan. 4, 2015 at the George Preston Recreation Centre. The four key members of the 1994 Stanley Cup finalist Vancouver Canucks squad will grace the ice again, this time as members of the Canucksâ€™ alumni. Most of the players theyâ€™ll be be skating against are 30 years their junior, as the alumni takes on the Langley Knights in a fundraiser benefiting Sophieâ€™s Place. The man behind the game is Knights owner, general manager, and head coach John Craighead, who saw&nbsp;exhibition action with the Canucks in 2002 as part of&nbsp;a 16-year career that saw him play for 16 teams spanning eight leagues and four countries. In 1996, six years before he pulled on a Canucks sweater, Craighead played&nbsp;five regular season&nbsp;games with another iconic Canadian team, the Toronto Maple Leafs, posting 10 penalty minutes. Five of those minutes came after he fought Canucksâ€™ then tough-guy Donald Brashear at Maple Leaf Gardens. Even&nbsp;though&nbsp;Craighead played&nbsp;for the Leafs&nbsp;in the regular season,&nbsp;memories from&nbsp;his exhibition games as a&nbsp;Canuck are&nbsp;the&nbsp;ones&nbsp;he cherishes most. They were, after all, his boyhood idols. â€œTo me, that was a dream,â€ Craighead said, of his brief time playing with the Canucks, before he was sent down to play for&nbsp;Vancouverâ€™s then AHL-affiliate, the&nbsp;Manitoba Moose. With the&nbsp;Moose,&nbsp;he&nbsp;tallied 15 points in 47 games in 2002/03. As a member of the Canucksâ€™ alumni, Craighead, 43, has taken part in events around B.C. to benefit a variety of charities. He usually skates with the alumni&nbsp;on Wednesday nights. Sophieâ€™s Place is a child advocacy centre focused on providing specialized services for physically, mentally, or sexually abused children up to the age of 18. The centre is a collaboration between the Surrey RCMP, Ministry of Children and Family Development, City of Surrey, Ministry of Justice Victim Services and Crime Prevention, and The Centre for Child Development. Considering the cause, Craighead would love nothing more than to see every seat filled at the GPRC for the game. If you want to watch the game and then attend a full-catered banquet in a formal setting with the alumni and Knights afterwards, those VIP tickets are $40 apiece. â€œThis gives you an opportunity to mingle with guys you would never have a chance to mingle with,â€ Craighead said. Keeping the ticket prices lower, Craighead said, gives everyone a chance to experience an event that he believes will be fantastic. The Canucks squad will be coached by a couple of NHL veterans: Dennis Ververgaert and original (1970-71) team captain/later head coach Orland Kurtenbach. Also part of the Canucksâ€™ alumni team are Garth Butcher and Dave Bruce. The Knights â€“ who boast a&nbsp; Pacific Junior Hockey League, Harold Brittain Conference-best 14-10-1-1 record â€“ are led by anthem-singing team captain Levi De Waal and forwards Carson Rose and Dylan McCann â€“ all of whom are currently among the leagueâ€™s top 15 point-producers. Craighead canâ€™t wait to play in the non-contact contest. 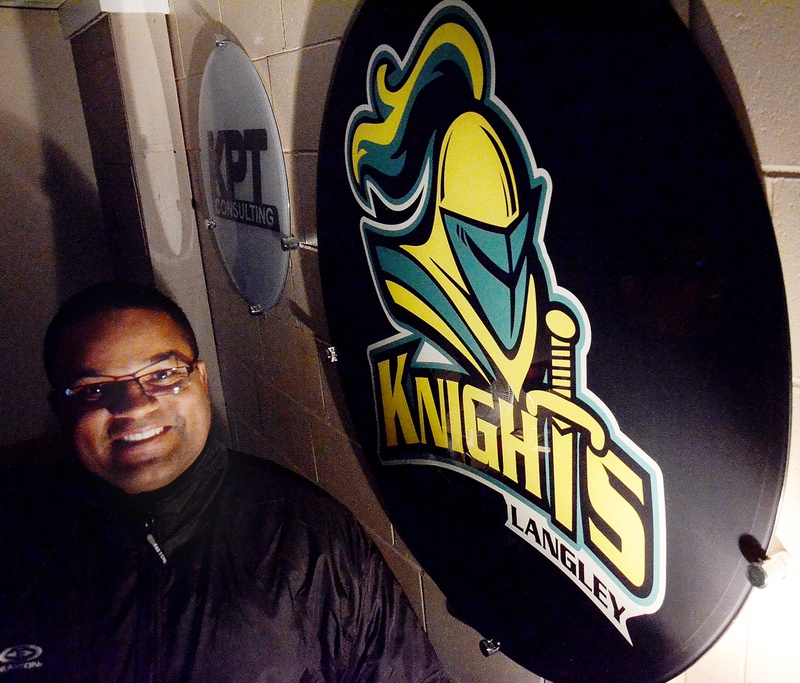 â€œIâ€™m just as excited as the [Knightsâ€™] players are,â€ Craighead said. Fans will be treated to a pre-game â€œmeet-and-greetâ€ autograph session beginning at 3 p.m., with the puck-drop set for 5 and the post-game banquet beginning at 8:30. Tickets for the game or the banquet are available through the Knightsâ€™ box office on game days or online anytime by visiting langleyknights.ca. He&nbsp;is the man behind bringing junior hockey back to the 41-year-old GPRC after a five-year hiatus, and making history in the process. While there has been plenty of junior A hockey representation in the form of the Lords, Eagles, Thunder (later known as the Hornets) and Chiefs, this year marks the first time junior B hockey has ever been played inside the old Brookswood barn.